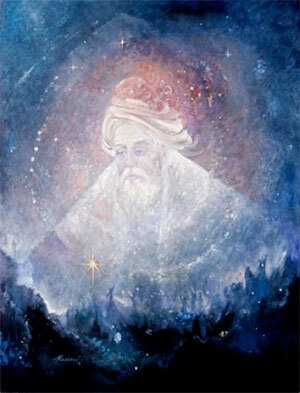 Jalal-e-din Rumi (Mevlana) (30 September 1207 – 17 December 1273) is one of the world’s most beloved mystical poets. He was a well known and respected Quran scholar living in Konya before he met the traveling Sufi dervish Shams of Tebriz. Rumi saw in Shams a divine presence. He experienced a spiritual awaking after that destined meeting of souls. Rumi abandoned his academic career and began to write his mystical poetry which flowed from his heart experiencing intense devotional love. Rumi said that no words could adequately explain the experience of mystical union but he tried. He produced a prolific range of poetry. He was born in Afghanistan. His family left Afghanistan when he was 5 years old. They settled in Konya after living in Baghdad, Mecca, Damascus and Malatya. Konya was the seat of the Seljuk Empire in the 13’th century. He lived in an era of turbulence. It was the era of the crusades. In his lifetime Konya was under constant threat of Mongol invasion. The great upheavals Rumi faced during his life is said to have influenced much of his poetry. Rumi composed his poetry in Farsi (Persian). He is beloved by all because his spiritual teachings are universal. The themes of his poetry are universal. His shrine in Konya is visited by millions every year from all over the world. Rumi belongs to humanity. His spiritual philosophy was based on the concept of “Unity of Being” which is the common theme in Sufi metaphysics. 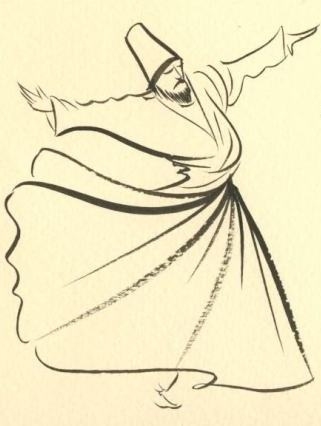 Rumi believed passionately in the use of music, poetry, and dance as a path for reaching God. His followers started the practice of “whirling dance” or “sama”. His teachings became the base for the order of the Mevlevi which his son Sultan Veled organized. In the Mevlevi tradition, samā represents a mystical journey of spiritual ascent through mind and love to the Perfect One. In this journey, the seeker symbolically turns towards the truth, grows through love, abandons the ego, finds the truth, and arrives at the Perfect. The seeker then returns from this spiritual journey, with greater maturity, to love and to be of service to the whole of creation without discrimination with regard to beliefs, races, classes, and nations. This entry was posted in spiritual practice, spirituality, sufism, tasavvuf and tagged Mevlevi, Rumi, sufism. Bookmark the permalink.